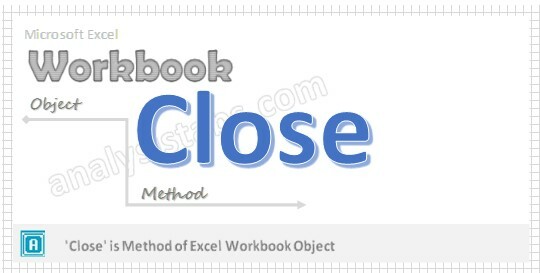 We can close workbook by using ‘Close method of workbook object in Excel VBA. It closes the workbook object. Please find the following brief description about close method of workbook object. Why we need to Close a Workbook using VBA? Once we perform the tasks in Excel Workbook, we need to close the workbook. And the whenever we want we can reopen Workbook again. Here is the syntax to close workbook using VBA. In the above syntax we are using ‘Close’ method of workbook object to close the workbook. Please find the below example, It will take you through to close workbook where SaveChanges:=True. In the above example we have created variable named Wkb in the first statement. We have used Open method of workbook object to open specified workbook named ‘D:\Sample.xlsx’ and then assigned it to object named Wkb in the second statement. At last in the third statement we have used ‘Close’ method of workbook object to close above specified workbook. Finally we have mentioned ‘Savechanges:=True’, that means if we have done any changes in the worksheet it will save the changes. Please find the below example to close workbook where SaveChanges:=False. The above example is same as like example 1 which we explained in the above. The difference is we have mentioned ‘Savechanges:=False, that means if we made any changes in the worksheet it discards any changes that have been made to it. The above mentioned code closes the active workbook.